Android 4.4 Kitkat is the latest operating system of android version as of the now, and it's built with awesome features in it. As we all know, durning the release of Android 4.4 Kitkat, the Nexus 5 smartphone was the first android phone that powered the operating system, and now, the OS version seems to be a little bit paramount to other android smartphones. Strolling through the new features and latest apps of the Android 4.4 Kitkat, you would notice the existence of Google Launcher being part of them. All credits goes to the Xda developers who managed to get the Google launcher from the Nexus 5 factory image. Today's stroll, I would be breifing you guys on how to install the Kitkat google launcher on any Android device. With the tips I would emphasis for you below, you wouldn't need to root your Android device and no need to even install any extra driver or app on your computer to accomplish the procedures. Step 1: Firstly, Download the Android Home launcher of Kitkat 4.4 here and extract the downloaded file to your desktop. 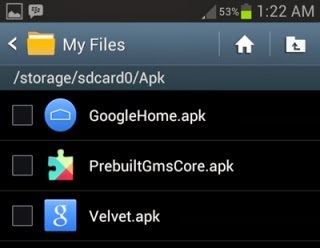 Step 2: Once the folder is extracted, then open the folder and you would find three apk files which are PrebuiltGmsCore.apk, Velvet.apk and GoogleHome.apk. Step 3: Connecting your android smartphones through USB cable to your PC, simply move those files from your PC to your android smartphone, then disconnect your Android device from your PC. Step 4: After that, on your android phone, locate the three files you moved from your PC, and search them with the help of file manager on your android phone. Step 5: Once the three files are successfully located, then install the three apk files one after the other, and follow the on-screen instruction to complete the installation successfully. Step 6: Finally, Once you're done with the installation, simply press the home button of your android phone and select Google Launcher as your default android laucher. 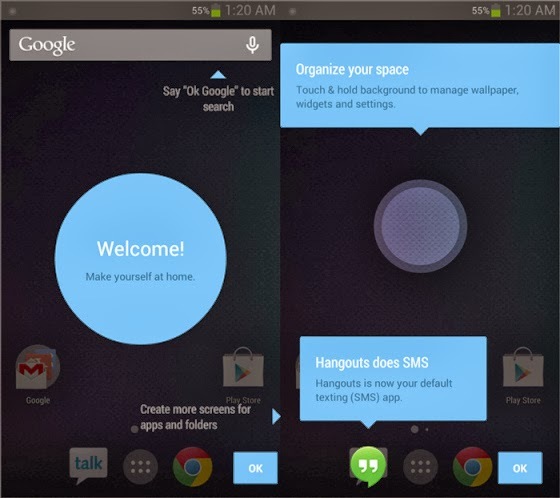 Kudos, It's finished.. Now you can flex the kitkat Google Launcher on your android smartphone. Do not Hesitate to let us know if you got any related problem. If you're encountering any difficulty with your android device, solve it here. Stay tuned and get updated by joining our daily email readers to get updated. To join simply Click Here, and also Like our fb page here to get updated. Try installing it again, is ur device rooted?